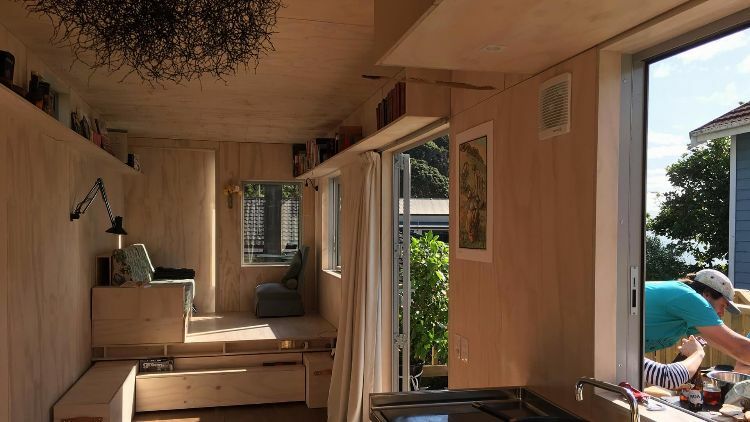 This container home tour is taking visitors all the way to New Zealand: Welcome to the Can House, owned by the lucky Kimberly Andrews and James Innes. 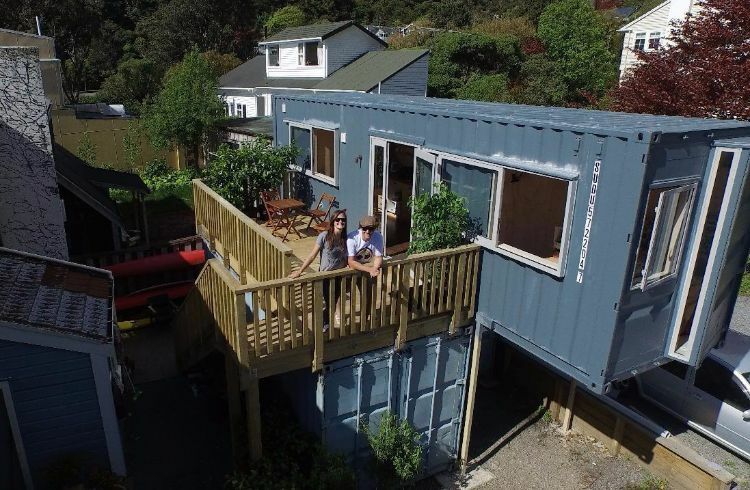 Located in Day's Bay, Wellington, this building features a 40-foot modified container on the top and two 20-foot containers at the bottom. The project was completed in 2015, and its owners were quite hands-on throughout the entire thing. You're going to see why in a moment. Here's the Can House in all its glory. As you can probably tell by that lovely deck area, the upper level is where this creative duo resides. 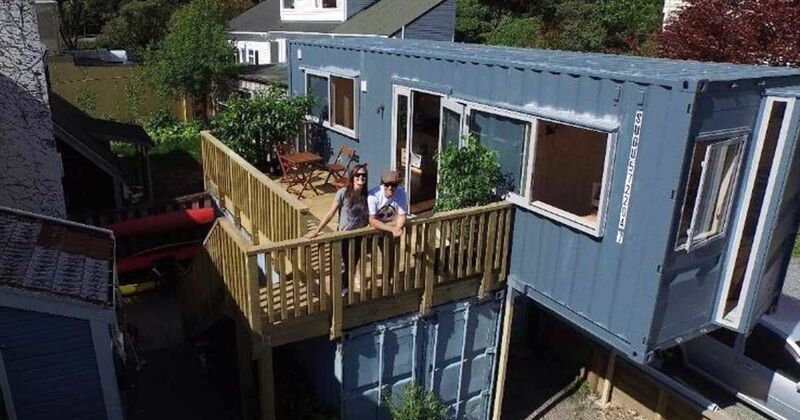 Their container home dream stemmed out of a desire to live by the beach, close enough to where they work, in a place that enjoys the clever use of spacing tiny living enthusiasts cherish so much. Needless to say, this dwelling ticks all the right boxes. 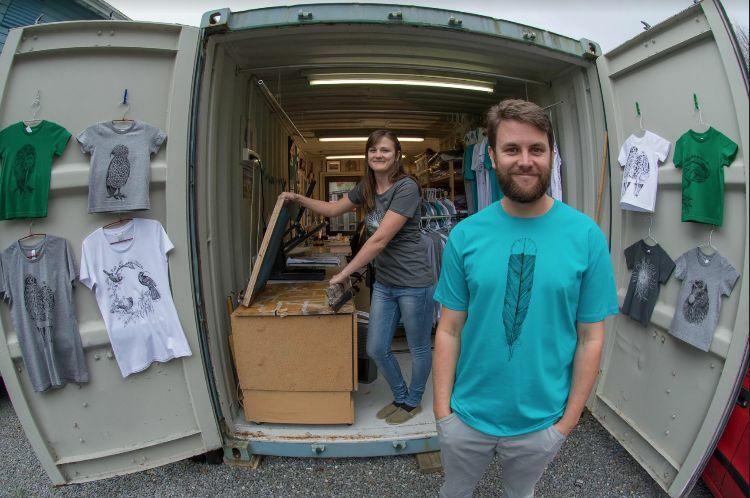 So much so, that the containers downstairs house their design and print company, Tumbleweed Tees. These guys are quite passionate about New Zealand's native birds and endangered species. Not only will you find them in their custom-made apparel, gift ware, and stationery, but they also donate $5 out of every adult T-Shirt sale to conservation projects around the country. We've shown you a bit of the exteriors - now, let's move on to the inside. 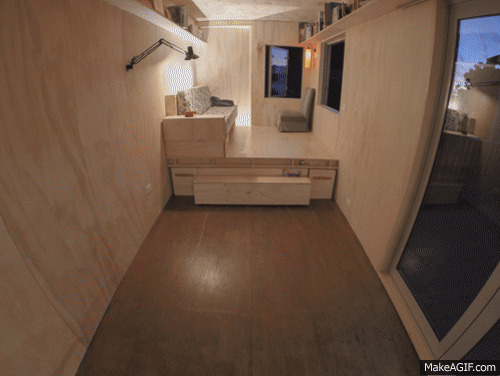 How's that for a nifty interior design? As you can see, the bed can be stored away for a bit of extra legroom during the day. Now for the non-GIF version. Plywood is the material of choice throughout these interiors, giving a sense of effortlessness to this home's aesthetics. You may have noticed that the Can House doesn't have any lights along the ceiling. This was deliberate: These are actually fitted in strategic areas, such as next to the sofa and right below the shelving and cabinets. By the way, don't you just love that tumbleweed lighting fixture? Along with a full kitchen, this corner of the house brings a discreet sliding door that hides the bathroom from view. 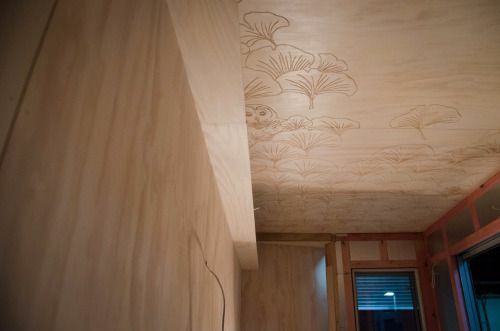 Check out this home's ceiling design. Kimberly and James came up with the patterns and drawings you're seeing here. These were inspired by their time working at the Natural History Museum in London and their favorite places around the world. Pretty cool, huh? Although pictures can tell us a thousand words, a video will show you the Can House in its truest colors. 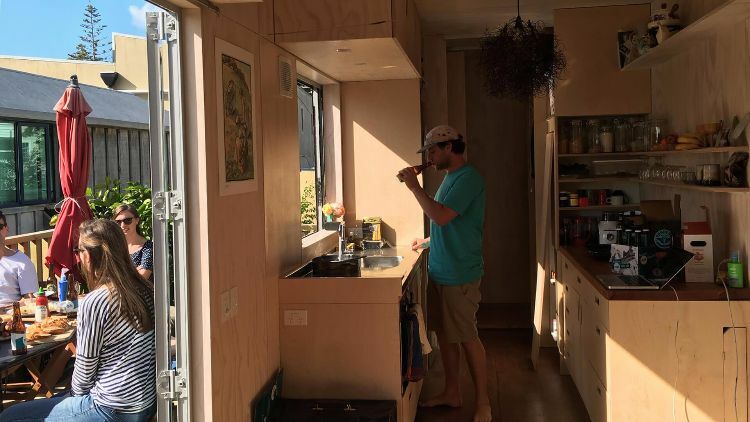 So, to wrap up this container home tour, check out the video.